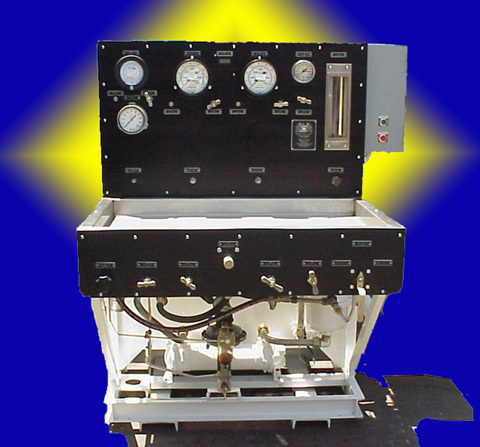 This unit is capable of testing actuators, valves, accumulators, and hoses. The Power Unit has a 700 series Denison variable volume pressure compensated pump with 30 GPM boost pump. It also includes a high pressure filter (3 micron), low pressure filter (10 micron), water heat exchanger, relief valve, check valve, drain valve, 60 gallon reservoir, electrical control enclosure with starter, fuses, and relay. This Test Stand gauge panel and control valve panel are mounted on an angle iron frame with stainless steel work sink which drains into the reservoir. The Test Stand construction is unique in that all hydraulic components are tank mounted behind the control panel, making access very easy to all items. This is a self-contained test stand with new, overhauled, and factory warranted components.